Cluttons Bahrain Winter 2017/18 Property Market Outlook: Static demands for residential and office property. Cluttons recently issued it’s Bahrain Property Market Outlook report for Winter 2017/18. For the fourth year in a row, the non-oil sector is driving the economic growth in the Kingdom of Bahrain where the government intervention programs rolled out across the Kingdom are encouraging the Kingdom’s growth year after year, especially in its real estate sector. Below is a short summary of what was mentioned in Cluttons Bahrain’s property market for Winter 2017/18 report. Rental market in Bahrain is entering a period of stability after a period of retreat that was recorded by an average of 16.2% when compared to the same period last year where rents were down by roughly 8% since the start of 2017. It is worth mentioning that rentals of villas have outperformed those of apartments but overall rents have gone down by 11% over the last 11 months for these types of properties except for expat-dominated markets were rents have fallen by 100 BHD per month. The report also noted that even though the demand appears as though it exceeds supply but the fact is that almost the majority of schemes underdeveloped are geared towards the luxury end of the price spectrum, all of which makes oversupply a real issue that keeps haunting the progress of Bahrain’s real estate sector. 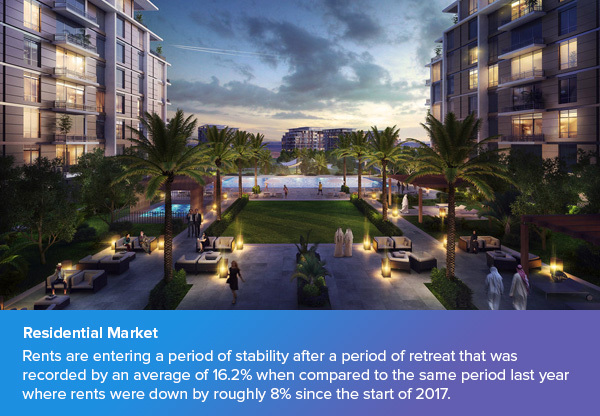 And while the requirements are weaker than this time last year, but according to Cluttons Bahrain, demand is relatively high for already established communities with well-managed facilities and amenities which caused an increase in the occupancy rates. There is an exceptionally increased demand across the 130 units at Cebarco Tower and Segaya Views in Manama where tenants are encouraged to rent units in both towers for they view the facilities and amenities offered at these two towers as good value for money. According to this, Cluttons Bahrain forecast that such communities will contribute to the overall growth and turnaround in rental values in such locations. Cluttons expect that residential rental market is likely to remain stable for the rest of this year and at the start of 2018 considering that the market absorbs the falls registered this year. Developers are showing a great interest in fueling retail developments in many of Bahrain’s established residential areas such as Juffair that has shown an upturn in the number of retail developments. Cluttons Bahrain expects that 500,000 square meters of new retail space will be delivered across Bahrain this year. The retail sector is considered a significant area of growth in the Kingdom’s property sector where rents across all location have remained stable over the last six months. 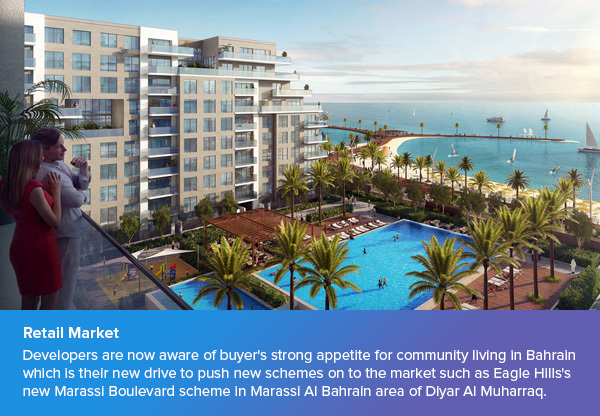 Developers are now aware of buyer’s strong appetite for community living in Bahrain which is their new drive to push new schemes on to the market such as Eagle Hills’s new Marassi Boulevard scheme in Marassi Al Bahrain area of Diyar Al Muharraq. It is safe to say that retail sector is playing a central role in helping various areas in Bahrain to unleash their full potential especially with residential tenants being driven towards areas that offer a high level of retail developments. Retail market according to Cluttons Bahrain views is a bright spot in the Kingdom’s property market and 2018 is likely to see rental rates remaining strong. The demand for office spaces in the Kingdom of Bahrain remains somehow static and dull with little to no number of inquiries. And even though the demand for shell and core spaces in relatively high but, the overall demand for office spaces in still weak. On the other hand, start-up businesses are active thanks to Tamkeen Initiative that support such businesses. 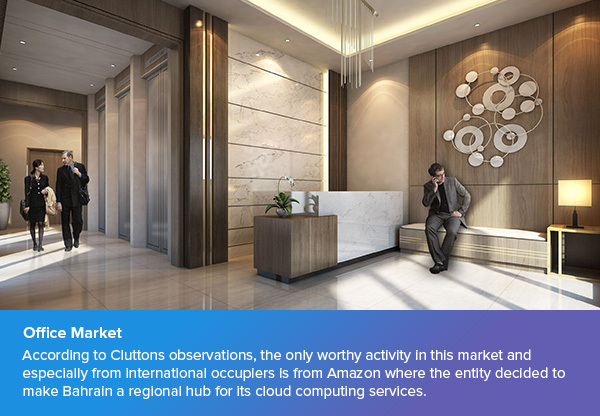 According to Cluttons observations, the only worthy activity in this market and especially from international occupiers is from Amazon where the entity decided to make Bahrain a regional hub for its cloud computing services. As viewed by Cluttons Bahrain, 2017 is likely to see a flat growth in Bahrain’s office rental market and 2018 will also see further falls.